I was looking at a Griso yesterday. Got to test ride it. Unfortunately the numbers didn't make sense and logic ruled the day as the dealer was asking high retail and offering a low trade in on my v7 (not surprising). I need to fix a few things on the v7. Im just out of warranty. I have a leak on both head gaskets. They have been retorqued, proper oil level and all that. Its a light weeping. The dealer gave me low trade in due to exhaust leak.Maybe dry clutch rattle im thinking? So essentially I loved riding the Griso. Simply its a fantastic machine in my opinion. How's the reliability been for you guys? Extended travel? Is the eldorado a more comfortable travel bike? Secondly how hard are V7 headgaskets to replace? Ive read some and have basic mechanical knowledge. Grisos are very reliable on the whole. However, it is possible for the (expensive) dash to fail, from uncontrolled internal condensation. Also, the swing arm bushings typically need greasing to avoid failure, due to a lack of grease at the factory. While doing that job the rear shock linkage bearings should also be greased. So long as the Griso is post-2013 (???) or so, there are no problems with the tappets, which had been a concern before. Grisos are powerful standard motorcycles, and so are suitable for extended travel. But they aren't touring barges. If you love them for irrational reasons they will be fine for extended travel. There are various luggage options. I recommend staying away from the leaky OEM fabric saddlebags. P.S. I've waterproofed my dash and added electronic cruise control. I'm also considering getting a Corbin seat. Seems like for extended travel you'd go Norge or Stelvio. If you want a new bike, then it'd need to be a Stelvio. With the Stelvio you get the same-ish motor and drive train as the Griso, more comfy suspension, better wind protection and larger tank and bags all built in. I have a 2017 Griso, an awesome bike, great fun to blast around on it, but for me it would need many tweaks/improvements to be my extended travel bike. Which are all the things listed above that Moto Guzzi has done to the Stelvio. I assume you've read about the v85tt? Maybe something to consider. 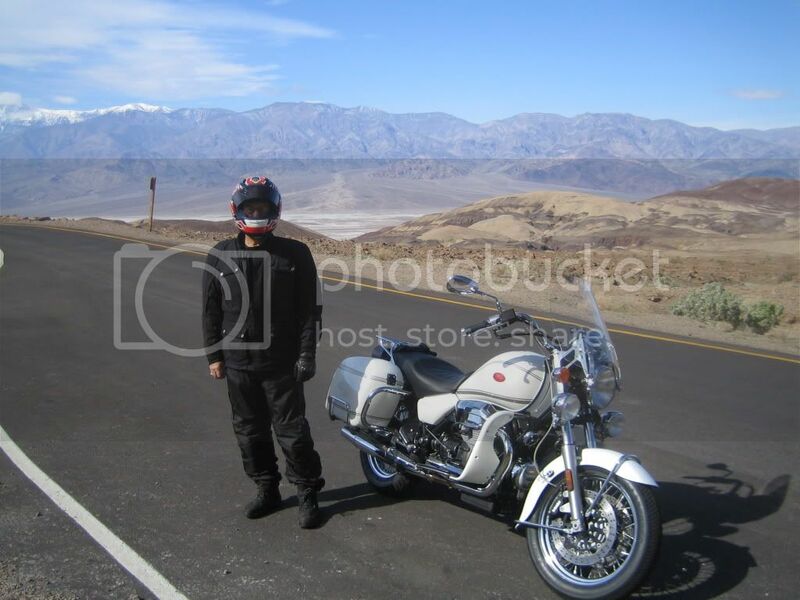 I have owned a V7 which I put 3,000 miles on, and own a Griso and a 1400 California Custom. The Cali Custom is a close match, riding wise, to the Eldorado. First of all, small block Guzzis and I just don't seem to hit it off. They are nice bikes but just don't do it for me. I think it's a combination of the stock suspension and the power output. I'm an admitted power addict and like the benefits that come with a bit more HP. I have put about 12,000 miles on two different Grisos (a 2006 and 2017) and consider them to be an excellent bikes. The Griso has plenty of controllable power, a great suspension and for me, great ergonomics. The 8v Griso is more refined than the pushrod Griso (2006-2007) although you can find the older Grisos for a great price - under $4,000. The older Grisos have the last of that great, big block pushrod engine that Guzzi built for so long. They are great bikes, but do suffer from some of the irritating problems mentioned earlier. Typically nothing that cannot be easily fixed. The 8v is essentially the same bike with a different engine. The 8v big block is very refined and smooth. I suspect you would see very few of the problems mentioned earlier on a 2014 or newer Griso. The Griso will cover most riding needs, from around town riding to light touring. I have a little over 30,000 miles on my 2014 California Custom. In my opinion it's a hard bike to beat for road riding. It's big, stable, comfortable and fast. It has great brakes (but so does the Griso). It handles amazingly well for a 700 lb bike. I don't consider it to be a great around town bike, as the gas mileage in stop and go traffic is abysmal. My biggest issue with the Cali Custom is the weight, although that only comes into play when you have to push the damned thing around. The Griso and Eldorado are completely different kinds of rides, so it kinda comes down to your primary purpose for the bike. For me, if I was primarily riding around town I'd keep the V7 or get a Griso. If I was doing a lot of weekend day trips in the country the Griso would be the answer. If I was doing some serious touring I'd go with the Eldorado. I'm going to assume that you're actually talking about the base gaskets leaking rather than the head gaskets? At the bottom of the jugs rather than the top? A leaking base gasket is a nuisance, but a leaking head gasket is more serious, with power loss and a whole raft of other potential issues. I can't say that I've read or heard of V7s being prone to either problem. Hopefully some owners will chime in on this. As for the exhaust leak, was this determined audibly or visually? Where is said leak? Has the rattle you mention been attributed to this? A poor exhaust connection that rattles should show some signs of blowby. Otherwise you might have a cracked exhaust bracket or a loose baffle in the muffler, which should have been warranty items. If the Griso speaks to you, then nothing else will do, and you'll get one sooner or later. No need to take it in the ear on the deal though. As others have said, with clean 2V Grisos selling for under $4k, there's one for almost every budget. Patience will bring rewards as spring approaches. "When you hit third gear, you'll forget everything she said"
If you have longish legs you won’t fit ona Griso. If you have longish legs you won’t fit on a Griso. 6'4" 35" inseam here. Custom seat and dropped pegs. I don't like the cruiser riding position. The Griso is a good handling standard. I have 33" inseam and finger tip to finger tip measures 75". 500 mile days with an air hawk and throttle lock was quite comfortable. But my knees don't complain too much. Right shoulder is another story. Of course I can't ride a forward foot control bike for more than an hour without my lower back hurting. Different issues for different folks. Just to clarify, the 2-valve Grisos never had a tappet problem, and all Grisos right up to end of the line had the nearly grease-free swing arm bearings and the potential dash failure (though the latter is a rare problem). Well i got my height from italian mother's side so the griso was quite comfortable. Its certainly a more aggressive riding position and i didnt expect to find it so comfortable but the darn thing felt luxurious compared to riding my v7 ii. Unfortunately yes the the leak is coming from my head gasket and not the base gasket. The dealer was a nightmare (not trying bash anybody but i went back and asked for help and they told me not to mess with it claiming overfilled oil. I wont even mention the fact they overtorqued my valve cover bolts. Charged me a ton for a first service where they overfilled the oil it puked in the airbox and didnt secure my seat). So if i can fix it i prefer it. The exhaust leak was determined audibly and that's why i take issue with the diagnosis. I have wanted a Griso for many years. 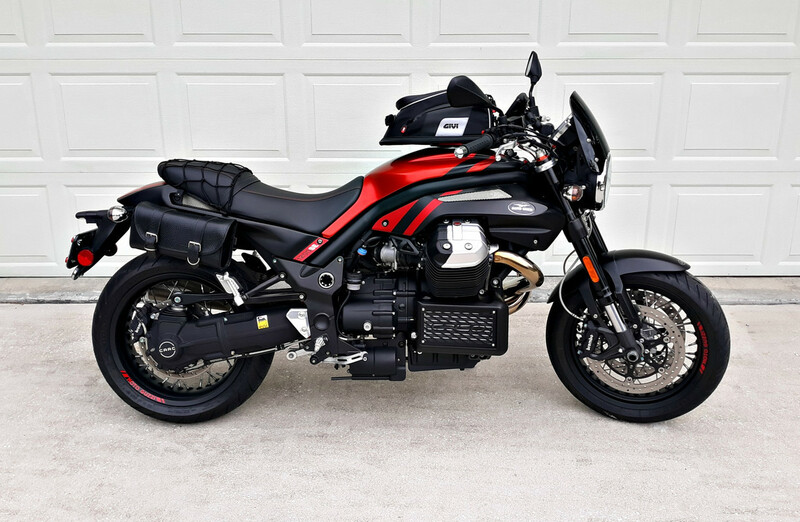 At first I lusted for a 2007 Griso, I just love the looks of those big ole jugs sticking out there. But sometimes I feel I might enjoy the power of the newer 8v Griso. Now I just don't know. I have never ridden either one and don't see any opportunity to do so. 2007 for $5,000+- or 2017 for $10,000+-??? My current ride is a 2015 Triumph Thruxton with about 70hp so maybe the 2007 Griso would be to much like it. Love the Eldorado to......so many bikes.... sigh. Im a 35 inseam and found my knees splayed by the tank. Why i didn’t think of the obvious, I haven’t a clue! Raising a seat and lower pegs can make all the difference. Very similar story as mine. I too came from riding Triumphs, and a few other brands, but Triumphs was my preferred ride. I had never owned a Guzzi prior to 2016, and I too lusted after the Griso after seeing one in 2011 or 2012. When I found out that they were being discontinued in 2016, I decided to get a new one while the getting was good. 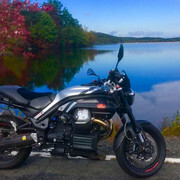 At the time my primary ride was a 2013 Triumph Trophy SE. 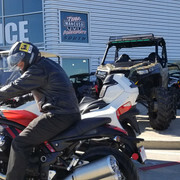 I was no longer doing long distance touring, but I was looking for a sporty, powerful and comfortable ride for local riding and weekend getaways. The Griso was the perfect candidate for that purpose. It has definitely been one of the most joyful and lively rides that I've owned, and its a bike meant for spirited riding. Its not a long distance touring bike (no real weather protection & limited luggage capabilities) but at 58 years old, comfortable enough to ride 4 eight hour days riding the Smoky mountains all over North Georgia, North Carolina and Tennessee last November. Over the last two plus years, its been rock solid and a bike that has become the one I wont get rid of. I had three bikes in the stable, but I always choose the Griso for the obvious reasons. You're right though, Guzzi makes some wonderful cruisers and tourers too. The Eldorado is another one of those very classy unique looking bikes. The Stelvio and California are attractive to me too. But, I purchased the Griso with a specific type of riding in mind, its been a great choice for that. The Griso was love at first site for me back in 2007 but just didn't make any sense at that time since most of my time was two up. The itch never went away and after I tired everyone out talking about how I wanted a Griso I finally got one 9 years later. Although I might buy another bike I'll probably never (you never say never never) sell the Griso. It's as good to own as it is to lust after. Like Zebra says it's a great "weekend in the mountains" bike doubles as an afternoon rider. Although there are quite a few who tour with them it wouldn't be my starting point for that mission. And my wife rode on it once! I bought a Tenni and had it rollered but only because it was fairly local. And that's the real issue; there aren't a lot of used Griso's to choose from out there. If you at patient, however, you should be able to find a factory rollered used Griso for somewhere in the middle of that spread. Not a big investment and not a lot of downside to see if it's the bike for you. I also have an EVT (see the wife thing) and thought about just replacing it with some version of the 1400. If she was still riding that's what I would do and that's certainly a more versatile starting point than the Griso. Since she only occasionally rides now I just keep soldering on with the EVT and as long as she doesn't ride on one of the newer ones I'll probably be o.k. ! Im definitely lusting after a Griso. I want to ride an eldorado and a v85 but that Griso feels like the right size and right amount of weight. Thanks for weighing in. Ive gotta replace my v7 gaskets so if anyone has further info on that please let me know. I always lusted after a Griso so when the opportunity came up to buy a 2007 I snatched it. It didn't take me long to realize the riding position was not good for my old bones, a Corbin seat and lowered Knight Design pegs turned it into all day comfort, last year I did an 8,000 and a 4,000 km trip. With an ugly top box and the two soft bags I can easily carry all I need for an extended camping trip. The range is a bit limited, I ran out a couple of times at 355Km (221 miles) but an extra gallon can strapped onto the passenger peg took care of that. For sure you need to take care of the lack of grease in the suspension bearings but that's an easy job. I think the Eldorado might be a better cruiser but you are also looking at a lot more money. Are you sure it's your V7 head gasket and not just the tappet cover?